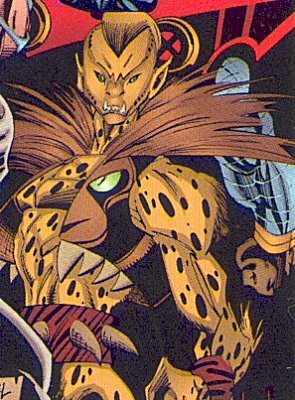 Powers/Abilities: A feral human-cheetah hybrid, Lethal is an expert hunter and tracker who relies on fear to weaken his prey. With razor sharp claws, Lethal is skilled in the use of traditional weapons such as throwing daggers and hunga-munga blades as well as modern weapons such as semi-automatic firearms. (Adventures of Spider-Boy #15) - Lethal made his first appearance and presumably faced-off against Spider-Boy (Pete Ross). (Assassins#1 (bts)) - Brought together by corrupt New Gotham mayor the Big Question (Edward Nigma Fisk), Lethal and his fellow assassins, Deadeye (Bill Lawton) and Wired (Nathan Chase), discovered that they had defeats at the hands of the same women (Dare and Catsai) in common. Together, Lethal, Deadeye, and Wired figured they could teach their mutual enemies a lesson in respect. Working for the Big Question made them think that the road to riches was all puzzled out . . .
(Assassins#1) - "Political Suicide" - Lethal attacked Dare (Slade Murdock) and Catsai (Elektra Kyle) in an elevator shaft within Arkham Tower as the two assassins were on a mission to kill the Big Question. Dare avoided Lethal's initial attack by using her internal "radar" sense to track and catch his throwing blades in midair. Catsai's pet cats then tripped Lethal, but he soon recovered and began to fire bullets at Catsai. But Catsai gracefully dodged the firestorm and used her blade-tipped whip to ensnare Lethal while Dare delivered the deathstroke with her sword. The female assassins left Lethal for dead. ADVENTURES OF SPIDER-BOY is an amalgam of Marvel's AMAZING SPIDER-MAN (Marvel's Kraven the Hunter debuted in AMAZING SPIDER-MAN#15) and DC's SUPERBOY. Although Lethal, Deadeye, and Wired have had long histories separately, ASSASSINS#1 marked the first time that they teamed-up to give a little trouble back to the source. Although Lethal was at the receiving end of Dare's sword in ASSASSINS#1, it is unknown whether he actually perished as a result of the fight.